I've always felt that David Féau was one of Los Angeles' unsung talents. If you recall, he helmed the kitchens at The Royce for a couple years, following the departure of Michael Voltaggio, but his tenure there, and indeed the restaurant itself, lasted only until the start of 2013, when the place shuttered to make way for a steakhouse. The Chef's initial plan was to start up a small restaurant-slash-retail shop-slash-boulangerie in South Pasadena, but sadly, those plans never came to fruition. He instead turned to working as a culinary consultant. Notably, he took the reins at Downtown's Le Ka as consulting chef, replacing Remi Lauvand, and later revamped the menu over at Lexington Social House. He also competed against Brendan Collins on Ilan Hall's Knife Fight in August 2013, and started his own soup delivery business called jeCook the following June. The last I heard from Feau (at Plate by Plate), he was planning a restaurant in the old Lexington spot, but that obviously fell through. 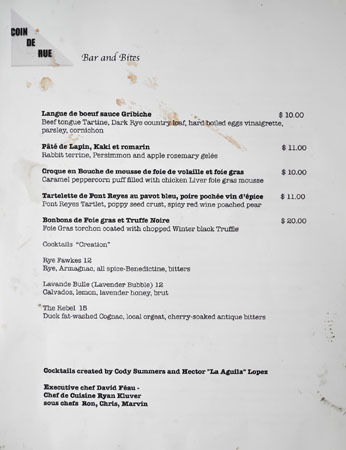 For this, his latest venture, he's partnered with Adam Fleischman (Tacoteca, Smoke.Oil.Salt) to bring us Coin de Rue ("street corner"), a pop-up at the old Red Medicine space. 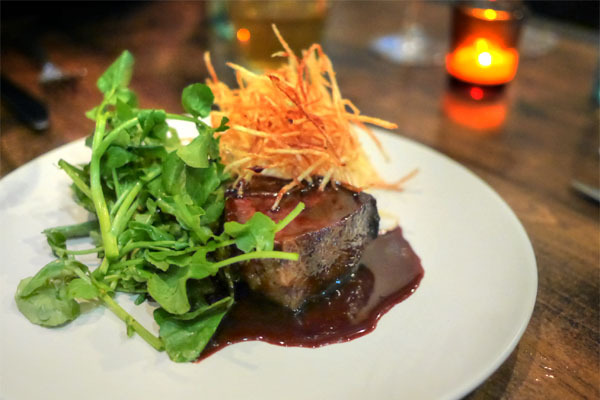 The dining series started on February 12th and ran through the 28th (Thursday, Friday, and Saturday nights only), and served as an opportunity to showcase Féau's lighter, more seasonal, more Californian take on French bistro fare. Inside, things remain much the same as they've been since the Red Med days. 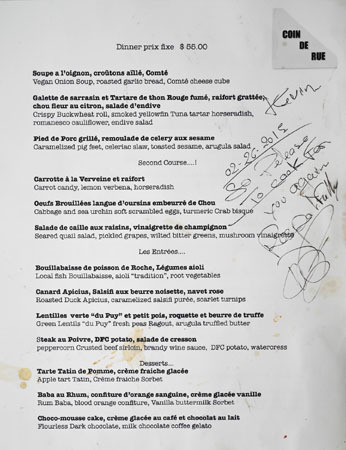 As for Coin de Rue's menu, it was based on a four-course prix fixe at $55 a head, with the option of supplemental "bar bites." 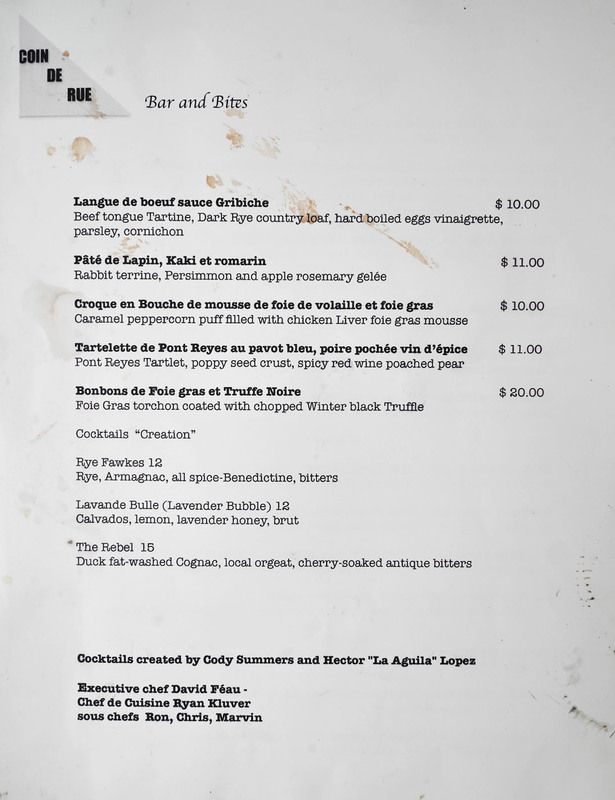 We were able to BYOB this evening, and there were also cocktails from barmen Cody Summers (Copa d'Oro, The Tasting Kitchen, Los Balcones) and Hector "La Aguila" Lopez. Click for larger versions. With only three cocktails on offer, we naturally had to try 'em all, starting with this, my favorite of the troika. Lots of citrus commingled with warm aromatics on the nose here, with a taste that highlighted the spiciness of rye alongside a bitter, medicinal flavor profile. 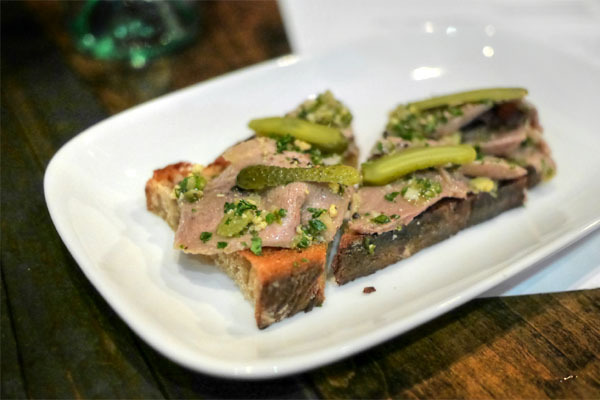 We began with the fivesome of bar bites, and the Chef's rendition of beef tongue made for a pleasing start. The langue came out soft and slick, with a distinct bovine quality to it that worked swimmingly with the tangy balance of the cornichons and Gribiche. 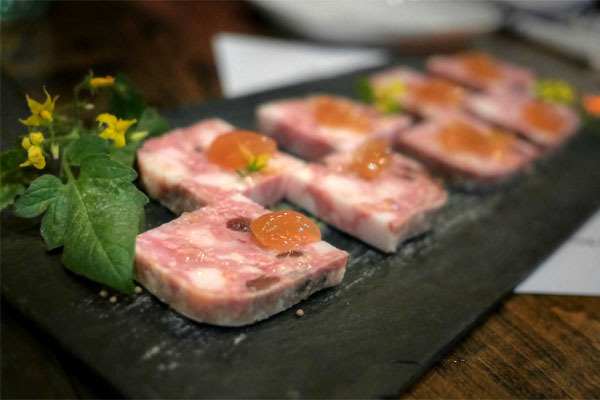 A pâté of rabbit was dense and rustic, with a growing savoriness complemented by the sweetness of the gelée. Even better, though, was the mustard, which added the requisite amount of piquancy to the dish. Our next cocktail was much lighter weight. 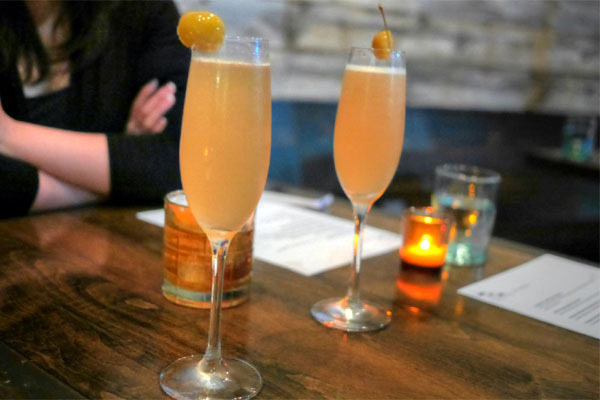 The drink didn't have much of a bouquet, but tasted of floral apple and citrus, a fun and bubbly concoction to be sure. 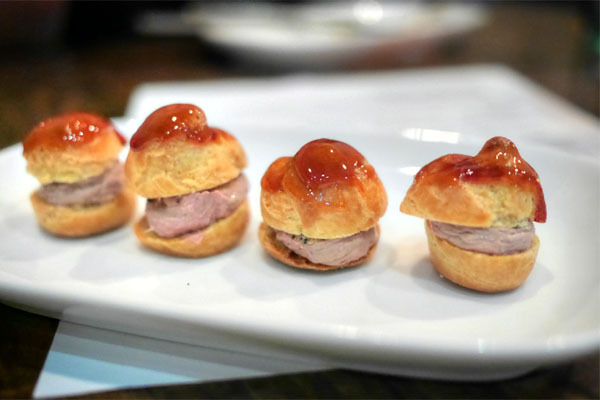 The petits choux were fun little bites. A blend of both chicken liver and foie gras, the mousse struck a balance between the power of the former and the finesse of the latter, giving up a satisfyingly deep flavor profile that paired well with the contrasting sweet and peppery notes present. Great crunch on the caramelized top, too. 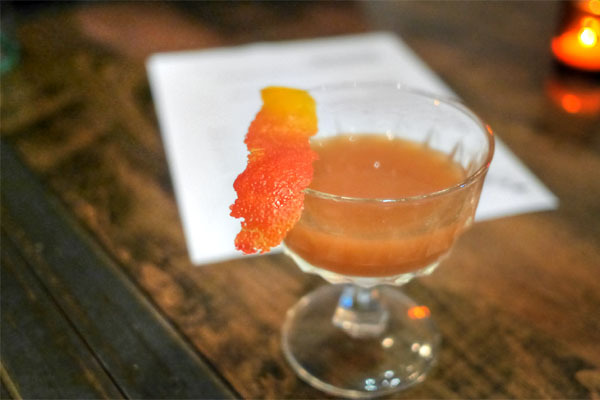 The third cocktail of the night was certainly the most challenging, showing off a savory, meaty quality tempered by an undercurrent of bittersweet cherry and accents of citrus. It was an experience that I found off-putting, unfortunately. 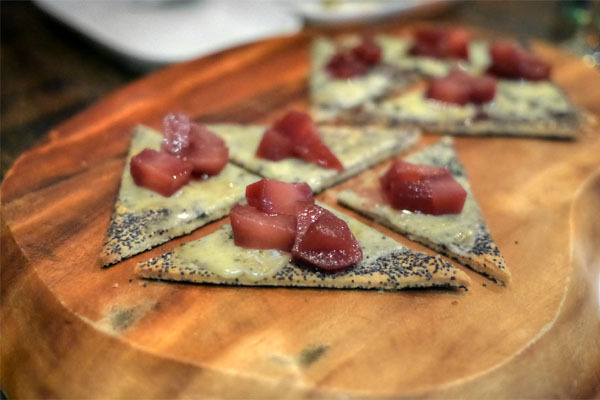 Féau's tart was superb, recalling a cheese plate in essence, with the strong, pungent punch of the bleu coming in full force, moderated by the sweet spice of the fruit, the whole thing presented over a delightfully crispy base. 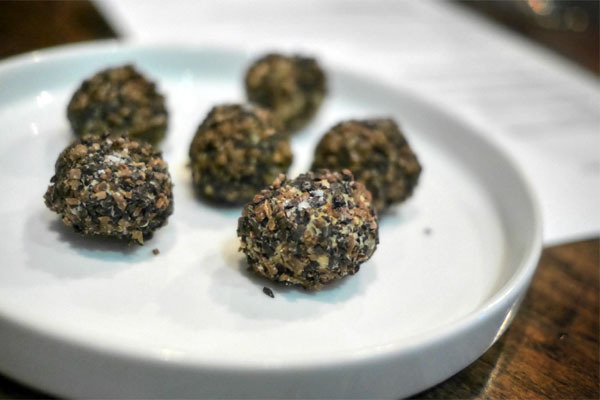 One can't go too astray with foie gras and truffles in play, and indeed, these were some decidedly decadent bites, with a blast of earthy truffle at first leading to the dense slugs of luscious liver, everything perked up by well-placed hits of salt. 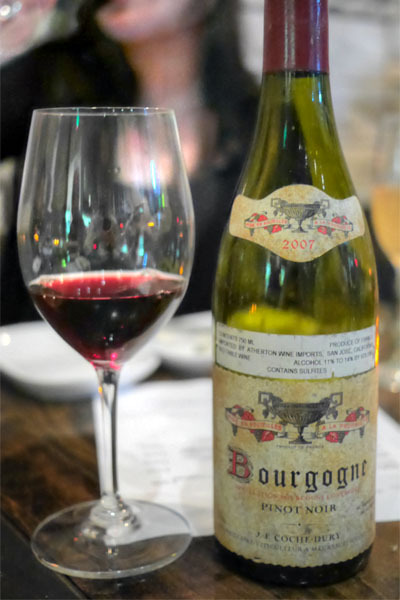 Fleischman was in the house tonight, and graciously provided us tastes of his 2007 Coche-Dury Bourgogne. I quite enjoyed the wine, finding it spicy, peppery, and jammy on the nose, with a soft, silky palate that brought more fruit, minerality, and some tannic character. 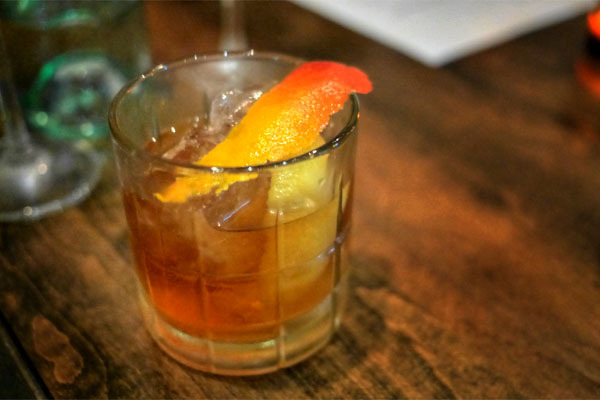 Easy drinking, a bit rustic, and very tasty. 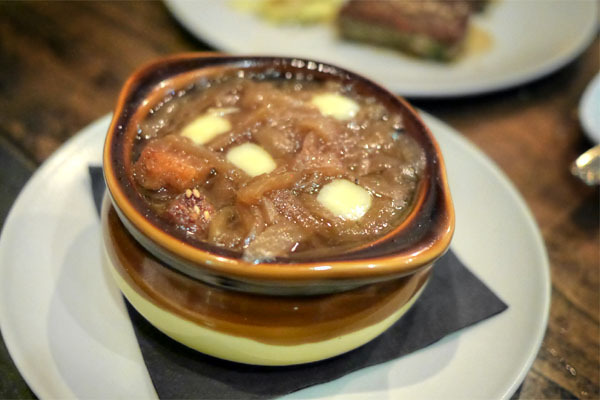 Féau's soupe à l'oignon delivered with its classically dark, sweet, hearty flavors (especially impressive since this ostensibly omitted the traditional meat stock), the garlic bread adding a nice heft to the soup. The key here for me was the Comté, which imparted a gooey accent that really brought it together. 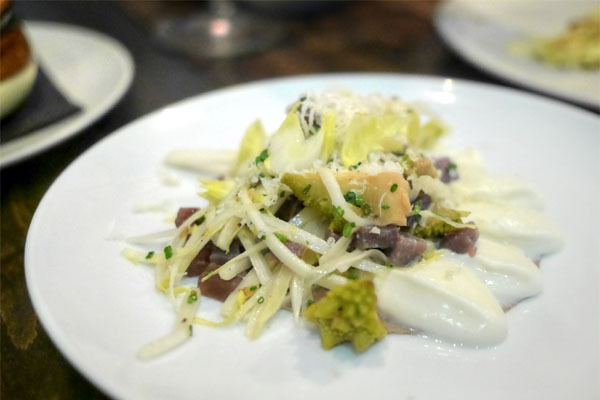 Tuna showed off a wonderful smoke in this next course, its robust flavors beautifully played off of the crunch and brightness of the romanesco and endive. I would've like some more crispness on the buckwheat, though. 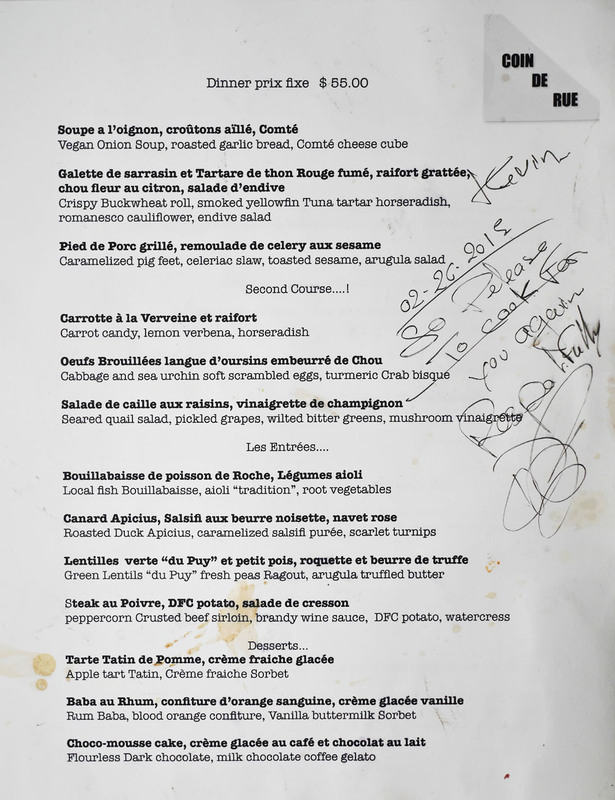 Apparently, the Chef was known for making the best pieds de cochon in Paris when we was working there during the late 1990's. That's a credible claim, given the strength of this dish, which was one of the strongest presentations of trotter I've had. The pork was beautifully textured, and just teeming with piggy goodness, the combo of celeriac and arugula providing the necessary counterweight to it all. 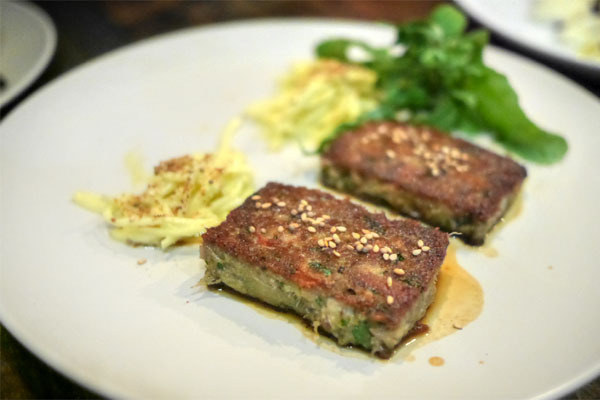 It was a table favorite, and was described by some of us as a "porcine crab cake." 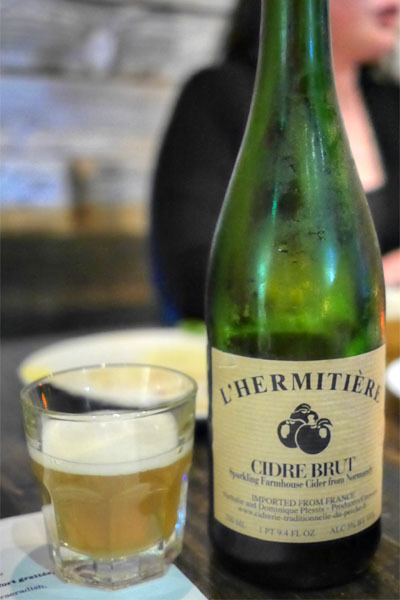 Next to imbibe was the Cidrerie Traditionnelle du Perche L'Hermitière Cidre Brut, a farmhouse cider from the Calvados region of Normandy. This is how I like my cidre: dry and acidic and funky, yet with soft, sweet notes of apple underpinning the whole experience. 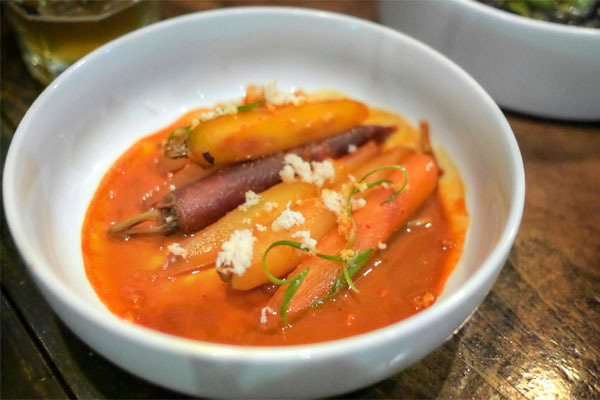 Carrot "candy," fortunately, wasn't overly sugary, instead offering up a smart presentation of the root veggie, with its inherent saccharine qualities deftly evened out by the zestiness and aromatics of the horseradish and verbena. 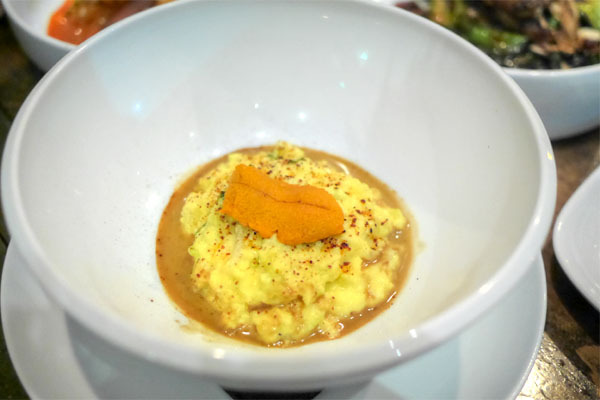 The pairing of eggs and urchin was a winning combination, as it oft tends to be, with the soft, supple eggs working as a great base for the butteriness of the uni. Even more crucial, though, was the bisque, which provided an umami-laced brine that really underscored the entire dish. I was a fan of the cabbage was well, which added both texture and a counterbalancing astringency to the mix. 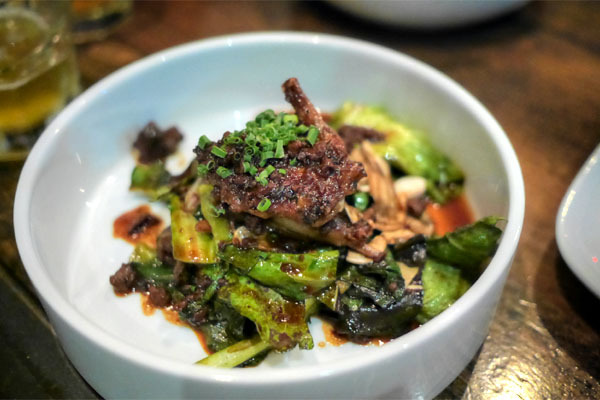 Quail was well prepared, arriving delightfully charred and dripping with a juicy, gratifying sort of savoriness to it. The bird was tasty on its own, but the bitterness of the greenery worked well as a contrasting note. 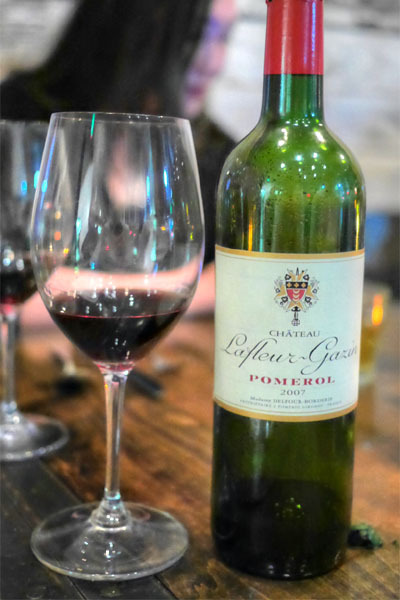 For our mains, I opened a bottle of Bordeaux, the 2007 Château Lafleur-Gazin from Pomerol. I found it to my liking, the wine coming in super jammy and earthy on the nose, while taste-wise, it had lots of pepperiness and even more fruit, as well as an offsetting tannic character. 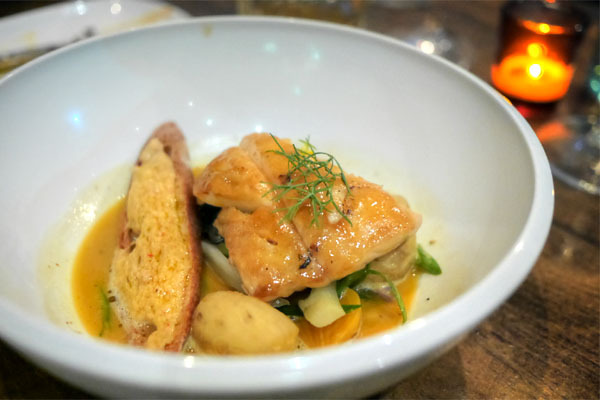 The Chef's interpretation of bouillabaisse did a commendable job showcasing the firm, flaky nature of the rockfish, its comparatively delicate flavors amped up by the richness of the broth while the veggies added a moderating element to the mix. Very good aioli too, which had a great depth to it. Duck was beautifully presented, and displayed deep, very "ducky" flavors that were set off by the sweet, sour, and spicy nuances present. Loved the bitterness and crunch of the turnips here, as well as the tough, jerky-like bits thrown in. Féau's lentils are the best I've eaten, and I've had the pleasure of consuming them multiple times at The Royce. As such, it wasn't surprising that this course was perhaps my favorite of the night. 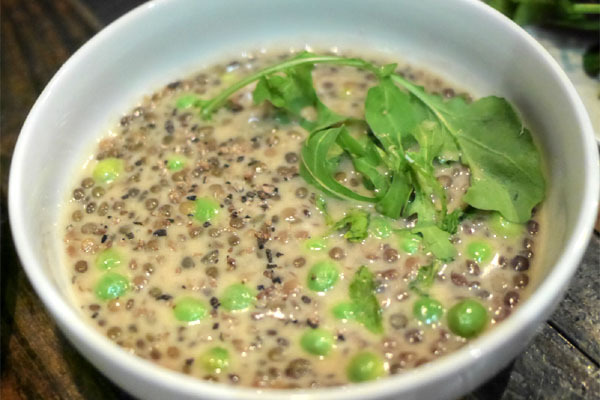 The lentils themselves were spot on--earthy and nutty and well-textured--and I loved the peas here, which provided both an offsetting brightness and crunch to the dish. Taking things over the top, meanwhile, was that beurre de truffe, which combined a lush, luxurious butteriness with the unmistakable musk of truffle. You just want to keep eating. We ended our savories with a reworked steak au poivre. The most interesting thing here was the "DFC potato," which combined fondant, espuma, and crispy fried preparations into one multifaceted whole. I quite enjoyed it, as I did the zestiness of the cress. However, the beef itself fell short. Though it was on point flavor-wise, the meat was simply too tough, distractingly so in fact. 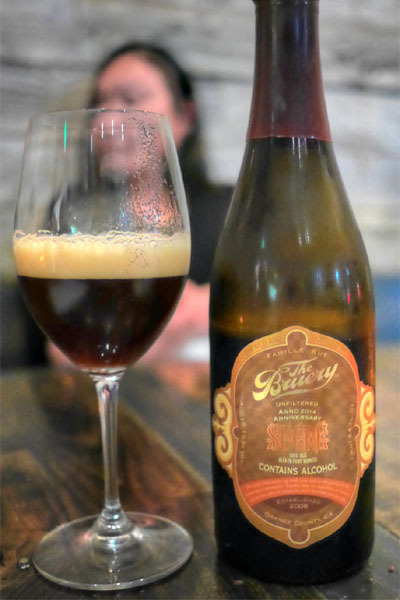 With the sweet stuff upon us, I brought out an appropriately "desserty" beer, the 2014 The Bruery Tawny Port Barrel Aged Sucre. Produced for the brewery's 6th anniversary, this was an English-style old ale aged in used port barrels. Think boatloads of dark fruit, malt, brown sugar, and toffee, overarched by a distinct vinous quality that really reminded you of the tawny. 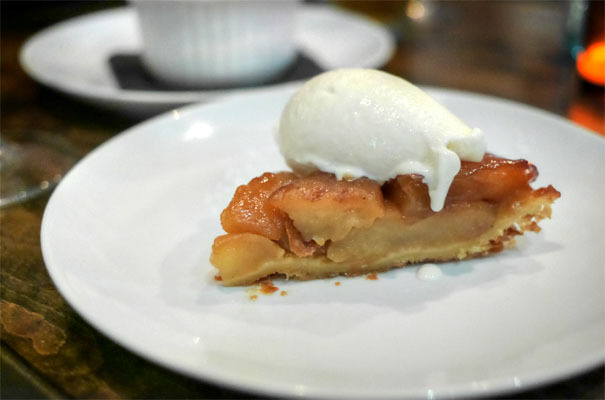 The Chef's tarte Tatin was pretty much perfect, conveying delicious notes of sugary, caramelized apple as well as a great harmony of textures, the whole tart accented by the light, bright sorbet. 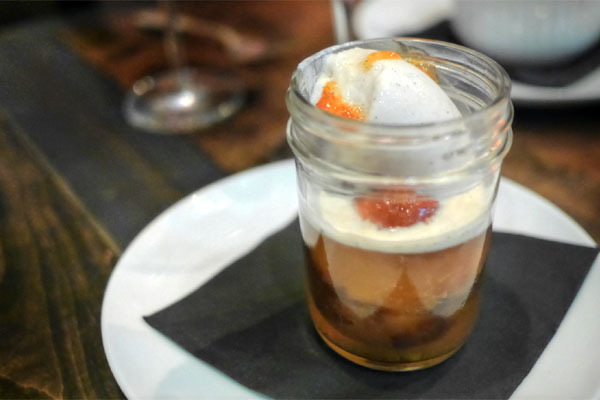 A rum baba was also delectable, with all the elements here melding into one delicious whole, the dessert coming in reminiscent of a boozy orange Creamsicle. 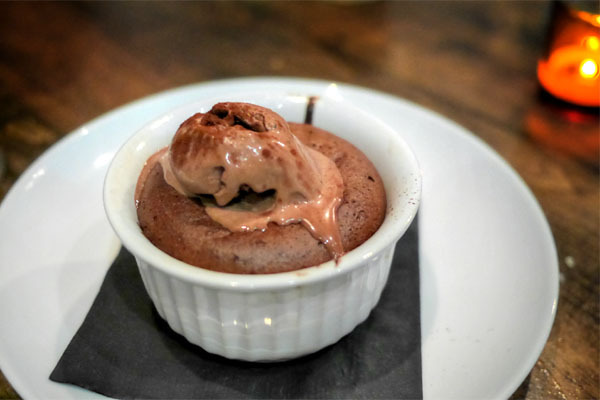 A soufflé-like cake was appropriately fluffy, with rich chocolate flavors taken up a notch by the incorporation of the gelato. Nice hot-cold contrast here to boot. 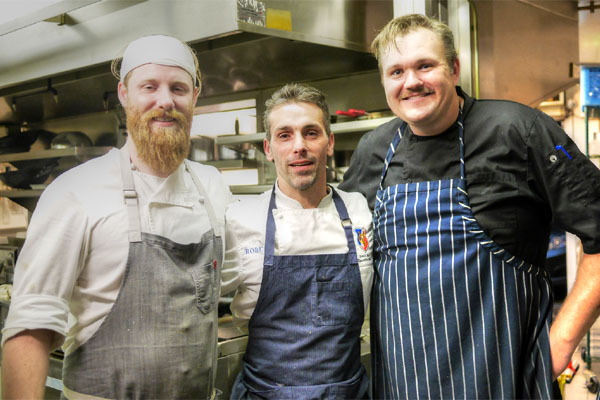 Féau at the end of the night, with Sous Chef Chris Rosenberg (La Poubelle) and CdC Ryan Kluver (who worked with David at both Lexington Social House and The Royce). After a two year hiatus, it was a welcomed sight to have David Féau back in the kitchen cooking again. 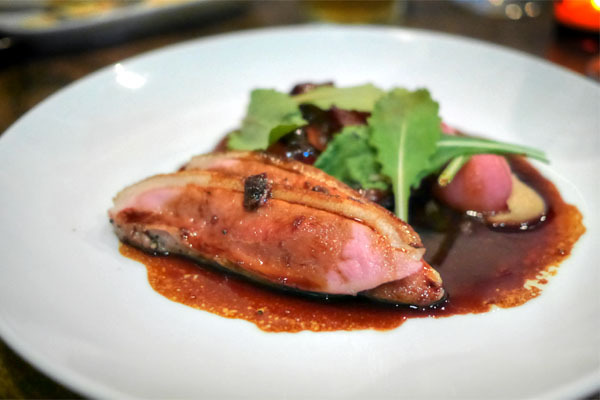 Though the food was certainly more casual than what he was putting out at The Royce, it was still able to show off the Chef's style: classic at its core, yet engaging. The question now is: what's next? The Red Med building was supposed to become The Flats with Kyle Schutte, but that deal fell through. Féau, however, isn't staying here. He's looking to do version 2.0 of the pop-up in April. He's also exploring a space in Larchmont Village for a permanent incarnation of Coin de Rue, which might be followed by a retail shop and a higher-end place. Let's cross our fingers. Awww..I would've loved this one. Thanks for the write up. I was wondering where Feau had landed, but I guess no where. Food looks good and seems to have been a pretty good value for $55.